We’d love your help. 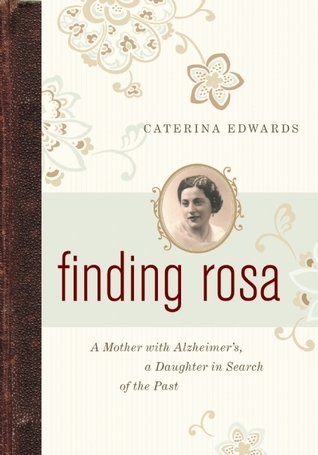 Let us know what’s wrong with this preview of Finding Rosa by Caterina Edwards. When her mother, Rosa, begins to show signs of dementia, Caterina Edwards embarks on a myriad of journeys — geographical, intellectual, emotional — that turn out to be part of one journey, a search for the meaning of the past and of home. During the four years she cares for Rosa, Edwards must navigate between conflicting responsibilities to self, family, and work while dealing with her mother's confusion, hostility, paranoia, and fear, and her own physical and emotional exhaustion. As Rosa loses her memory and her self, Edwards travels to Istria, now part of Croatia, where she discovers a suppressed history of ethnic cleansing, loss, and displacement that altered Rosa’s life course irrevocably. This frank memoir limns a multifaceted history of two women in crisis, one struggling to maintain a sense of self against the demands of disease and the weight of a dark past, the other seeking understanding and solace in the face of something that resists both. To ask other readers questions about Finding Rosa, please sign up. Caterina, I'm intrigued by the notion of "exposure" in a memoir. It's one thing to be comfortable with exposing yourself. But what if the person you're writing about is not comfortable with "warts and all" exposure? Can you be fair to your story but also to them? Caterina Edwards My first response is to say you owe your story your truth, but (of course) it is more complicated than that. The key word is "fair." A portrait…moreMy first response is to say you owe your story your truth, but (of course) it is more complicated than that. The key word is "fair." A portrait without warts or shadows is boring, as well as false. We are all fallible. I lead a memoir workshop, and I find older women sometimes insist their childhood, their parents, were perfect, when everything was far from it. And if the older ones want to present a sentimental picture, the young ones sometimes want to only show the darkness and evil. Painting someone as a villain (and yourself as a victim) doesn't work. If your experience is mostly negative, why not include the P.O.V of someone else - perhaps even that person - so the story is balanced and fair. Try to understand and explain. The editor of "Finding Rosa" convinced me to remove a long scene that reflected badly on a relative by marriage. The editor asked me what the purpose of my story was. And I had to admit it wasn't to expose the woman. So focusing on the essence of your memoir helps. It is a continuum: as writers of memoir, we have to find our place on that line. How much do you tell? It depends on what is important to you. But readers do sense falseness and lies, as well as unfairness. It shows in your prose style. I'm reading a memoir by Anne Roiphe. She explains how in a previous memoir, written years earlier, she hinted that her brother, who died of AIDS, was homosexual. She still feels guilty about that revelation. Her nephew stopped speaking to her and told everyone she was a liar. (Even though his mother eventually confirmed it.) Still, she feels she made the right choice. She says family secrets are toxic. Unfortunately, exposing the secrets can lead to a spread of that toxicity. She evokes Aeneas leaving Try, carrying his father on his back. We all carry our parents on our backs. Finding Rosa is part memoir, part history lesson, part detective work, about the author's years of caring for her mother with deteriorating Alzheimer's, while trying to piece together the history of her mother's life. Complicating things, Rosa's homeland no longer exists. Istria is now mostly Croatian, but also belonged to Austria, Italy and Yugoslavia all in rapid succession. The Istriani are described as the 'forgotten Italians', and the author learns of atrocities and ethnic cleansing, hundred Finding Rosa is part memoir, part history lesson, part detective work, about the author's years of caring for her mother with deteriorating Alzheimer's, while trying to piece together the history of her mother's life. Complicating things, Rosa's homeland no longer exists. Istria is now mostly Croatian, but also belonged to Austria, Italy and Yugoslavia all in rapid succession. The Istriani are described as the 'forgotten Italians', and the author learns of atrocities and ethnic cleansing, hundreds of thousands of displaced refugees, and unknown numbers missing or murdered by being buried alive in 'le foibe' (deep sinkholes). She makes several trips to Trieste and her mother's homeland to visit relatives and interview 'i rimasti' (the remaining ones) and finds public records have been destroyed to hide the evidence of missing persons. Since I know a few Istriani, I knew about some of the things that happened in Istria's history, but I did not know the extent of the horrors or the fact that displacement happened not once, but 3 times in the 20th Century. I loved this book on so many levels: a human interest story about the conflicted relationship between a daughter and her mother; a historical and genealogical exploration that rediscovers, explains, imagines and enlivens a lost world; a window into the life of one writer; instruction in the craft of writing creative non-fiction that draws on a multitude of disciplines--archival research, oral history, memoir, biography, travel writing, and more. Caterina Edwards is teaching a writing family hist I loved this book on so many levels: a human interest story about the conflicted relationship between a daughter and her mother; a historical and genealogical exploration that rediscovers, explains, imagines and enlivens a lost world; a window into the life of one writer; instruction in the craft of writing creative non-fiction that draws on a multitude of disciplines--archival research, oral history, memoir, biography, travel writing, and more. True story. Understanding that her mother has Alzheimer’s, Caterina Edwards tries to find out her past. And uncovers many things that were never known: exactly how old was her mother? Are the stories she tells true or just stories? She learns of the family’s past in Istria (now part of Croatia, but owned by many, in rapid succession). And many times, she's unable to answer her questions, but does have a better understanding of her mother and her mother's past in a war-torn country. When Rosa begins to show signs of dementia, Edwards takes on the role of caretaker and makes a room in her house. Rosa’s memory may be going, but her criticisms are as stinging as ever. In one of the book’s most poignant passages, Edwards receives a morsel of praise she has been hungering for— a few months before her death, Rosa grants her the long withheld “thank you”. At times, Edwards can come across as a little too self-sacrificing. But her poetic prose, along with her ability to weave together disparate narratives, elevates her story far above the clichéd ‘mommy dearest’ confessional into the realm of fine literature. At the end, Edwards has a quiet pride in knowing that “by nature and design” she has “become her own woman”—nothing like her mother. For anyone who longs to understand—and overcome— the effects of a difficult parent, Finding Rosa is an essential read.